This easy Slow Cooker Chicken Enchilada Chili recipe has a little bit of a kick, but a bit of cheese and cream cheese helps mellow everything out at the end. You get that comforting chili heat, but it’s not overly spicy — just super flavorful. 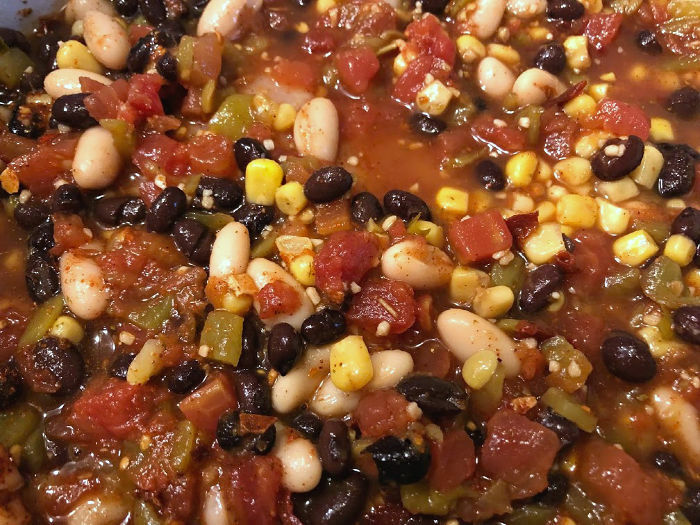 Because we’re expecting yet more winter weather here in Chicago, here’s a hearty & comforting Slow Cooker Chicken Enchilada Chili recipe to warm both your heart and your belly. 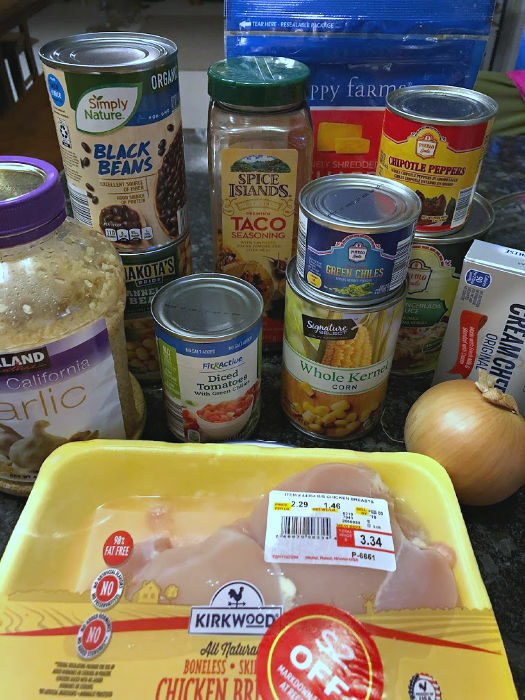 Middle School Guy is a huge fan of this recipe, which I’ve made a few times now and have been meaning to write up for you — because everyone should have a big comforting pot of chicken chili in their lives! You don’t even have to top yours with cheese, because it’s already in there to cut the heat of the rest of the ingredients, adding a little creamy tang to smooth everything out at the end. 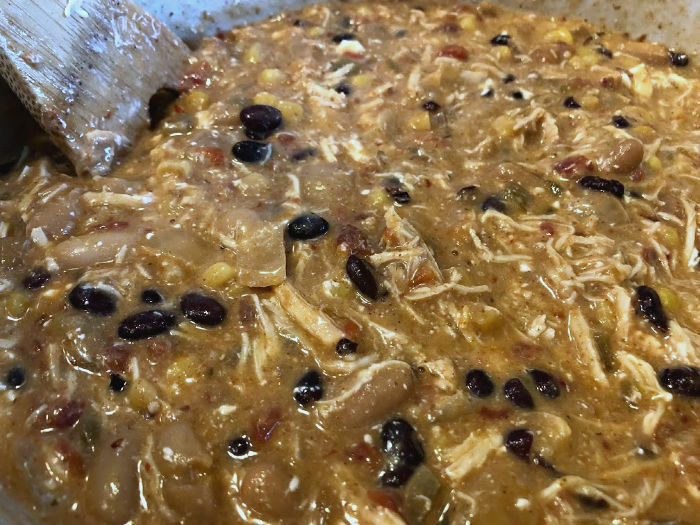 You get a little pop of sweetness from the corn, and the chicken & beans make this a filling, protein-packed chicken chili recipe. Psst — need a use for the leftover enchilada verde sauce and cream cheese from this recipe? You can make these vegetarian enchiladas verde tomorrow! Trim chicken and chop your onion and chipotle peppers. Add all ingredients except cheese and cream cheese to the Crock-Pot and stir, ensuring that the chicken remains completely submerged. Cook chili on low for six hours. Remove chicken, shred, and return it to the crock. Chop cream cheese into smaller chunks. Stir the cheese and cream cheese into the pot until both are completely melted into the chili, then serve. Note: If you are sensitive to spice, you might wish to omit or cut down on the chipotles & sauce, or replace the diced tomatoes with green chilies with plain diced tomatoes. 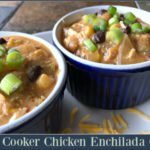 This is the most comforting Crock-Pot Chicken Enchilada Chili! 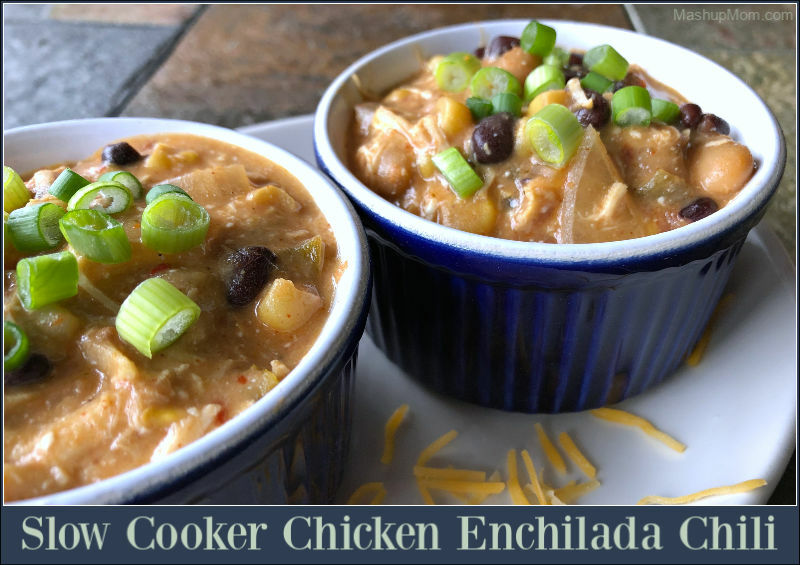 Slow cooker chicken enchilada chili is the ultimate in comfort food for a chilly day. 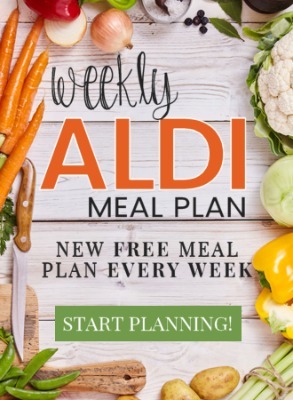 And how easy is this to make? 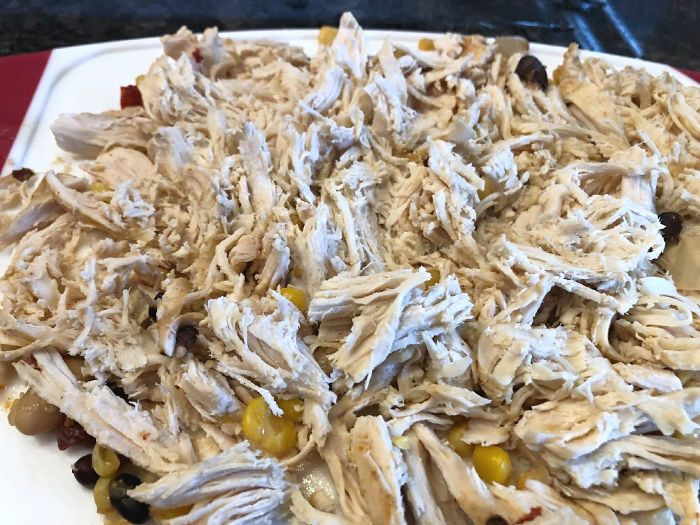 Just take 20 minutes to throw everything into your Crock-Pot in the morning, and ten minutes to shred the chicken and stir in the cheese at the end — the rest of the time, everything just slow cooks itself in this mostly hands-off chicken enchilada chili recipe. 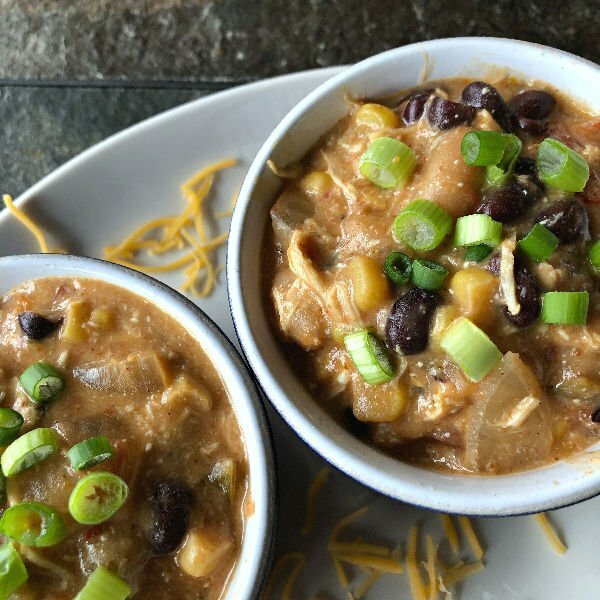 This Crock-Pot chicken chili recipe does have a bit of a kick, but the cheese and cream cheese help mellow everything out at the end so that you get that good chili heat without it being overly spicy. This easy Slow Cooker Chicken Enchilada Chili recipe has a little bit of a kick, but cheese and cream cheese help mellow everything out at the end -- you get that comforting chili heat, but it's not overly spicy. If you are sensitive to spice, you might wish to omit or cut down on the chipotles & sauce, or replace the diced tomatoes with green chilies with plain diced tomatoes.